Your benchmark is up 9.3% so far this year, but you’re not. Should you care? Absolutely you should care. You can’t measure performance without a yardstick. The purpose of this note is to convince you not to care too much. Recognize that your benchmark is imperfect, and that it’s more important to understand what is driving the relative performance of your portfolio, not so much the magnitude. For Seed Wealth Management’s growth oriented investors, we use the Vanguard LifeStrategy Growth Fund as our benchmark. As of June 30th it was up 9.3% year-to-date. It’s is an actual fund that our clients can invest in themselves at minimum cost. If they fired us and put the proceeds into this fund, they could do a lot worse. In fact, year-to-date, most would have done better. So why don’t our clients fire us? Arguably, we didn’t add “alpha”, a common term for “excess risk-adjusted return” relative to a “passive” investment in “the market”. The answer comes from a more careful appreciation for the definitions of these terms, especially in the malleability of their meaning. 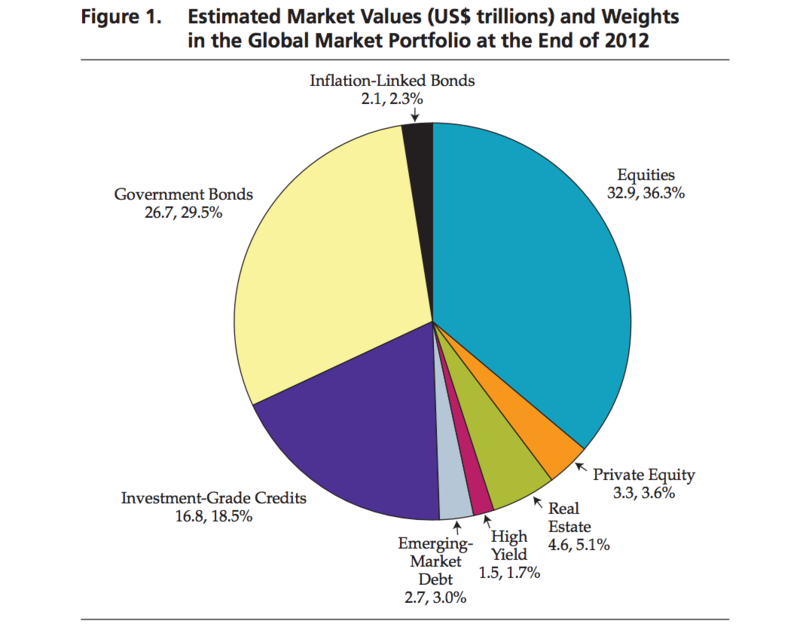 In short, the “market” only exists in theory, not in practice, and includes all global assets. As such, “passive” investing is a myth. You can’t replicate the market even if you wished to. We outsource the task of replicating the market to third party vendors like Standard and Poor’s (i.e., the S&P) and MSCI, but they are only approximations. With no true proxy for the market, there is no way to accurately measure risk adjusted excess returns, or “alpha”. Do we expect to outperform our benchmark over longer periods of time without taking on more risk? Absolutely, especially after taxes…but not because we’re smarter than “the market”. We expect to reduce risk through personalized diversification and maximize return by maintaining a value bias. We further increase the odds for our clients to outperform by keeping our fees and our clients’ taxes low, the two variables we know we can control. If you peel back the onion, over 50% of the equity portion of this index is overseas and many of the government bonds have negative yields. This is not a portfolio we’d ever want to construct for our clients. It is certainly cleaner, but it is no longer “the market.” Nor is the S&P 500 and certainly not the Dow Jones Industrial Average. No. Even by choosing Vanguard’s definition of “the market”, we are taking the first of many steps away from being passive. We have actively chosen to outsource the makeup of our benchmark. Is our choice reasonable? Judging from another recent academic paper, the answer is yes. A simple global mix of 50% equities and 50% government bonds returned on average 4.65% annually since 1960, mildly better than their more inclusive global market portfolio, and with lower volatility. When we decide to accept a higher degree of volatility (i.e., risk) for a higher expected return by increasing our allocation to equity, we take our second big step away from being passive. But we’ve only just begun. Vanguard takes our third step away from being passive by allocating only 40% of the equity portion of the fund overseas vs the market’s 52% allocation (as measured by the MSCI index). How reasonable is that? Again, it’s impossible to know for sure, but using historical returns as a guide, it is reasonable. But it’s not passive. At this point, we start to diverge from our benchmark and become even less passive. As the graph above shows, if Vanguard’s 40% allocation to international is reasonable, so is 25%…closer to our allocation mainly because it lessens our exposure to currency risk (see this paper by AQR). We also favor the merits of value investing. We believe, based on reams of empirical evidence, our 25+ years working in the capital markets, and common sense that you get paid to take risk which others are looking to avoid. Or as Warren Buffett likes to say, we are greedy when others are fearful. This thinking applies across asset classes and within both equity and fixed income. Maybe. As unsatisfying as that answer is, it’s true. We can’t determine whether we are adding risk adjusted returns to the market if we can’t measure the market. 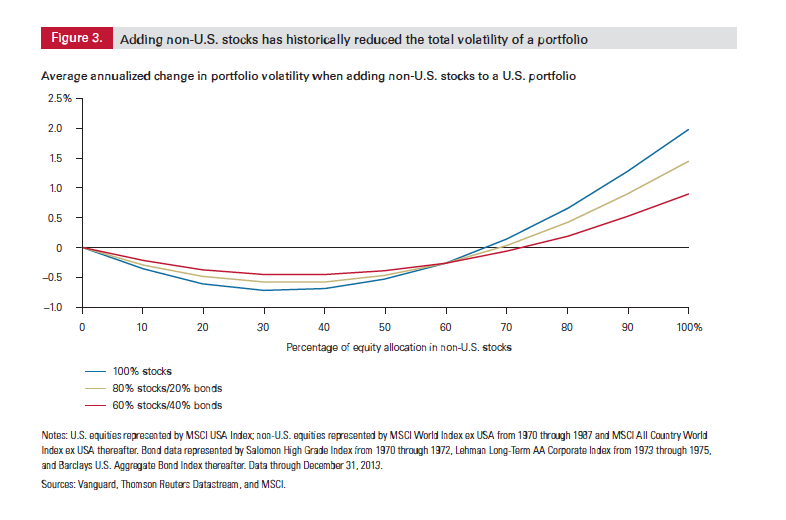 We can and should measure how we do versus our best version of the market, Vanguard’s portfolio with 40% equities. By this yardstick, our growth investors outperformed so far this year. But these investors only outperformed the Vanguard market proxy because we took more risk in the form of 80% exposure to equities. Equities were up a lot. Compared to the Vanguard LifeStrategy Growth fund with a similar equity exposure, we typically underperformed. The most important task is to understand why we underperformed. International stocks did better than domestic stocks so far this year as the dollar declined in value, China’s growth resumed and European politics stabilized (as measured by Vanguard’s ETFs VSUS and VTI, 14.9% vs 8.9%). In addition, value stocks underperformed growth stocks (as measured by Vanguard’s ETFs VTV and VUG, 5.0% vs 14.6%) as growth stocks like Facebook and Netflix continued to soar. And for the trifecta, interest rates went back down as inflation fears dissipated. We felt, and still feel, the market is underestimating the risk of inflation, so we didn’t fully participate in the ensuing rally in bonds. Given these active decisions away from our benchmark, we underperformed. Relative to Vanguard, our underweight to international stocks, overweight in value stocks, and lower exposure to interest rate increases are all based on thoughtful, theoretical reasoning, common sense and empirical support, not on our hopes to outsmart the market. Those rationales haven’t changed. We still don’t pretend to know the future direction of the dollar, interest rates or stocks like Facebook, so we might also underperform the proper benchmark in the next 6 months. Over an extended period of time, though, our strategy to limit currency volatility and maintain a value bias should pay off. In fact, although past performance isn’t indicative of future performance, those accounts with more than a 12 month history with Seed Wealth Management have outperformed their benchmark. Should we promote this outperformance of the benchmark as having created “alpha”? Alpha, as a reminder, is a measurement of excess risk adjusted returns. Bloomberg’s allocation analyzer says we generated alpha for our clients. But we also took risks in terms of fixed income credit, closed-end fund liquidity and smaller company equities that they even didn’t try to measure. It worked out great, but wouldn’t have if China actually did implode or oil stayed at $20 a barrel. We didn’t and still don’t have the hubris to pretend to know exactly the direction of oil or the economic future of China, but we did know we were being paid a lot to take on that risk. Now we are not offered as much return so are reducing risk by allocating away from these more volatile assets but in a tax efficient manner. Conclusion: Just because we don’t know doesn’t mean our job stops. Our inability to construct a true market portfolio, invest passively, and properly measure how we’re doing in terms of alpha is frustrating. But these realizations are also liberating. We can now focus our attention on areas that we know we can control. Are we properly diversified, taking into account not only our clients’ 401Ks and legacy assets but also the unique risks associated with their jobs? Are we placing their least tax efficient assets in their tax-deferred IRA’s and recognizing capital losses to optimize tax efficiency? And lastly, are we paying too much in mutual fund fees. Our clients should independently ask if they are paying us too much for these service? At an average advisory fee of 25 basis points (1/4 of 1%), all have answered “no”. Low fees, optimal tax efficiency and customized diversification are the three pillars from which we built Seed Wealth Management. Adhering to these principles help us create value for our clients and allows them to take full advantage of a value-centric portfolio. Ours is a commonsense approach to investing that is rooted in academic theory and is empirically robust. And we believe we will outperform our benchmark after taxes and after fees in the years ahead. But don’t give us credit for generating alpha. Judge us based on our approach. If you’d like to read more about the fallacy of passive investing, read our recent article published on Alpha Architects’ blog here. To explore our approach in more detail, visit our website.